Yes, of course, just write the wattage on the lamp itself. Peggy Archer shows you how. 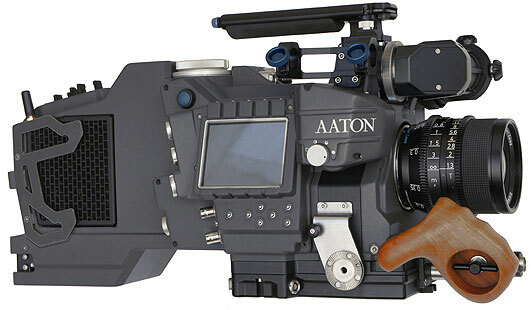 It's the Aaton digital camera. The Delta Penelope. Will it make our movies better? Well, possibly a small amount. Will it make us more money? Uh. Arguably maybe a few thousand dollars more? It's a CCD camera instead of CMOS. I believe that means no rolling shutter distortion so handheld shots which we want to motion track composites into should be easier. I'm sure the Delta Penelope will be worth every penny. When I say "every penny" I do mean about $150,000 after you get all the accessories and lens kit for it. Let me run the numbers here... if we gross an average of even $30,000 a movie and the Penelope cost $150K then we have to make five extra movies which otherwise have no expenses to pay for the camera. All right! I do wish that the camera would do an ISO of 1600. I know it's got 14 stops and all but a 1600 ISO just makes my day. Oh dear. The price might actually be more like $250K with accessories and lenses. At 90,000 Euros or a thousand dollars a day to rent, it STILL doesn't make any financial sense. That BlackMagic camera is just as amazing EXCEPT for the rolling shutter (and the fact that the sensor on the Aaton is bigger). It would just be so nice to have an Aaton on my shoulder.